Hólmavík is a village in the western part of Iceland, by Steingrímsfjörður. It is the largest settlement in Strandir and serves as a centre of commerce for the county. 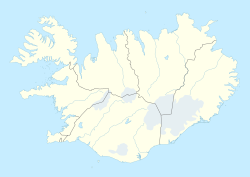 Hólmavík is part of the Strandabyggð municipality and has 375 inhabitants (2011 census). Hólmavík is home to the Museum of Icelandic Sorcery and Witchcraft. Well-known people from Hólmavík include the poet Stefán frá Hvítadal and the musician Gunnar Þórðarson of the band Hljómar. The artist Einar Hákonarson has a studio and a home in Hólmavík. Hólmavík is served by Hólmavík Airport. There has not been any scheduled flights to Hólmavík for many years. Bus schedule is provided by Strætó, Reykjavík City Bus. This page was last edited on 2 October 2018, at 10:36 (UTC).